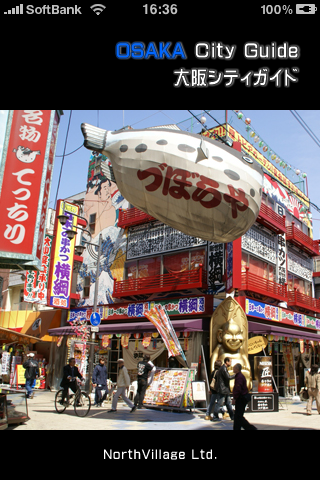 It "OSAKA City Guide" which is convenient for sightseeing and life of Osaka. A noted place, art museum, museum, shopping, the explanation such as theaters and basic information and nearest station, the publication including the bus stop! In Masuno who I am connected to the Google map, and knows the place of the destination, it is very convenient for Osaka sightseeing when I tap a map! 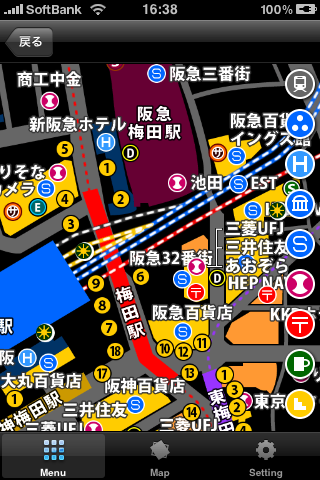 I tap thing and Map which I choose the destination from genre choice, and display a map and can display direct Google map. As for the Google map, choice is possible from nine genres. I narrow it down to "only a world heritage" and can display it. 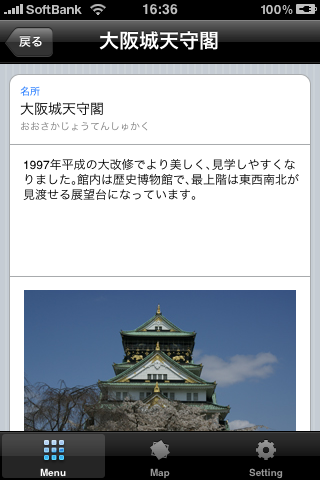 On a set screen, Map can change the map (Umeda, Namba, Tennoji, Osaka Castle, and Nanko) displayed first. 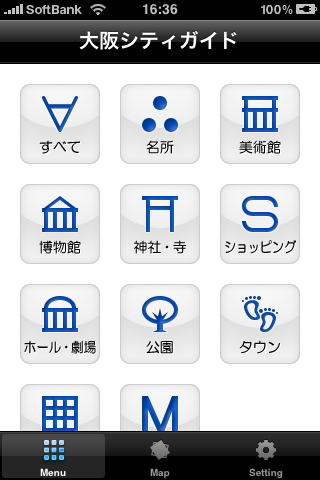 ●The basic information such as institutions. ※The photograph and the explanation of unpublishing the addition are scheduled by the update. In this application program, there is a download limitation. The information update to this application program (2010 versions) doesn't correspond after January, 2011 though the download period of the update by the information addition and the correction, etc. corresponds until December 31, 2010. The use of the application program is possible after 2011. It is the present on January 15, 2010. The information of the publication changes it, and it may be revised. Because I do not compensate you in us, approve the damage by the contents which I carried beforehand.